Image by Anke Katrin Eissmann . A plant has a power to cure all sorts of wounds and act as the Magic Antidote. One of the favorite forms of an external healing source, close to Healing Potion, of which it may be one ingredient. Among its other advantages, it can make a good MacGuffin. It can also show a person is close to nature and even symbolize that nature makes characters well. A certain amount of Truth in Television: many plants are the root source of medicinesnote A surprising number of medicines were discovered by either investigating folk cures (some of which actually worked, and some of which did not) or by taking extracts from random plants (you get a bunch of work-study students, you drop them off a mile apart along some backroad with a box of bags, and you tell them "pick up five of everything you see") and running them against various screening tests to see if they did anything (this approach is generally called "Weeds and Seeds" or "Find 'Em and Grind 'Em"). However, in Real Life, they are not Magic Antidotes. Like drugs derived from them, herbs can have side-effects, sometimes quite serious, even fatal; they can interact with other drugs; , and unlike the drugs, natural variation in growth means the dosage is unpredicatable, and there will certainly be impurities. For safety reasons, therefore, do not include Real Life examples. Someone serious about herbal medicine can find much better sources than this wiki. In fiction, they are more likely to be a Panacea. See also Fantastic Fruits and Vegetables. The realistic version is That Old-Time Prescription. The Spice Rack Panacea is another take on it, where a herbal remedy cures something in fiction (or is proclaimed to cure something in real life) that it technically should not be able to cure. The Senzu Beans which are grown by Korin, the wise old talking cat. They can heal all of the eater's wounds, and as a bonus sate their hunger for ten days. Unfortunately, they take a very long time to grow, and there are some things they can't fix (like the Saiyans' tails being removed, or the heart virus Goku contracts). In an episode of Dragon Ball Z, Gohan remembers his dad showing him how to make a medicine out of a leaf, which he uses on himself when Piccolo leaves him alone in the wilderness. He later uses an even bigger one to heal a wounded dinosaur. In Belladonna of Sadness, Jeanne makes a deal with Satan to become a witch. Afterwards she can heal people and make magical potions with the belladonna plant. It's a Dangerous Business, Going Out Your Door: The beneviolet, a rare mountain flower that grows in high-magic areas. The natural magic of the areas it grows in mixes with the plants own biological defenses, resulting in the grown flower being a powerful remedy against many kinds of illnesses, including the deadly Horn Rot. Disney's Tangled opens with a magic flower, which is put into a soup for the queen in order to heal her of a fatal illness that befalls her. The powers are actually passed on to the queen's daughter, Rapunzel, in the form of long, golden hair, and because of this the newborn baby is stolen by Mother Gothel so she can use the child's powers to retain permanent beauty. The powers are even used at the end of the movie when Rapunzel is able to heal Flynn Rider using her tears despite her hair being chopped off and losing its magic. Laumspur, a wild herb with bright red flowers, which you can find over most of Magnamund. Most common ingredient for Healing Potions. Oede herb, which has golden leaves, is considerably rarer, but powerful enough to qualify as Panacea. In the Fighting Fantasy gamebooks, if a character is bitten by a werewolf they can cure themselves of it by chewing belladonna. You take some Stamina damage, but it certainly beats getting turned into a werewolf. There's also a number of Fighting Fantasy books where your character can find or buy some healing herbs. In The Lord of the Rings, Aragorn uses athelas (or kingsfoil). It seems to have general restorative properties, and he uses it to treat Frodo's knife-wound and victims of the Nazgul's "black breath" after Pelennor. By the time of the story it's thought of as an old-fashioned folk remedy used mainly by elderly mennote which is to say, men who are around Aragorn's age but aren't long-lived Dunedain like him which really irritates him because it makes it hard to find. 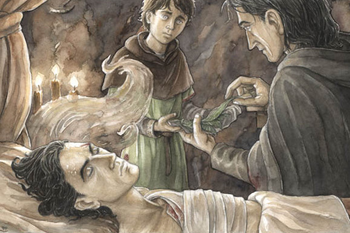 In The Silmarillion, Lúthien uses one to cure Beren's wound. In Saga of the Volsungs, Sigmund completely cures Sinfjotli from a mortal wound by touching it with a magic herb brought to him by a raven. "Adara's rose" in The Belgariad will cure any poison with its fragrance alone. Its creation is one of Garion's Achievements in Ignorance: he was only trying to conjure up a flower as a gift to a friend and doesn't learn that it's a panacea until years later. Sorcha's profession is as an herbalist in The Sevenwaters Trilogy. In Andre Norton's Dread Companion, Kilda uses the notus on Kosgro's wound. Inflammation dies down while she does it. In Andre Norton's Catseye, medical plants are one treasure of the Wild. In Warrior Cats, because the characters are cats and obviously wouldn't have access to or knowledge of human medicine, their healers, known as medicine cats, use herbs instead. The Way of Kings (first book of The Stormlight Archive): A much more realistic example is knobweed, the sap of which is a powerful antiseptic. The heroes make a small fortune by taking advantage of the fact that Sylphrena is very good at finding patches of these weeds, far better than the workers employed by the local doctors. In Masques, Aralorn finds a ridiculously effective pain-numbing herb when she's badly injured. It has side-effects, though; you can't eat anything under the influence because it will make you throw up, and you will be noticeably drugged and not quite there. In the state she's in, it doesn't matter to her. The Land in The Chronicles of Thomas Covenant has aliantha, berries which are surprisingly nutritious and refreshing, to the extent that just a few a day (less than a handful) with no other food or water can keep a person alive indefinitely. They also cure a variety of ailments including leprosy, at least while the person remains in the Land. They are, however, stated to be an expression of Earthpower, which is basically magic. A Hat Full of Sky: Played for laughs. Tiffany learns the Doctrine of Signatures from Miss Level, based on a real-life medieval idea that God placed a "signature" on every plant that indicated its medical use, to those who could read it properly. This being Discworld, the signatures are literal, and with a special magnifying glass, you can read them on the stems. Sadly, plants are terrible spellers, but Miss Level has worked out a great many cures this way, such as goldenrod being good for jaundice, which turns skin yellow. In "Godfather Death", Death takes his godson out to the forest and shows him a herb that can cure all patients except those which Death intends to claim for himself. By use of this herb, the godson becomes a famous physician. In The Two Princesses of Bamarre there is the moily herb, an elven flower that can ease pain and heal wounds. In The Cold Moons, it's shown that badgers understand basic medicine. Tendril heals Bamber's torn and sore paws using a mixture of water, chewed grass, and chewed herbs. The badgers of the Cilgwyn forest have a badger specifically dubbed "the Healer" who helps heal sick badgers. In Merlin, Gaius' second-most common explanation as to where Merlin is is that he is out collecting herbs for him. There are other times when Merlin actually does go out to collect the rare herb needed to heal an important patient. In American Horror Story: Coven, Misty raves about the healing properties of swamp mud, and proceeds to rub it all over a boy's wounds. It works, but her magic may have had something to do with it. In Arrow, Yao Fei and Oliver make use of healing herbs found on Lian Yu to greatly speed up healing and counter poisons. In Season 4, the Golden Lotus is a magical herb that's used to cure Thea of her Lazarus Pit-induced bloodlust. Iron Crown Enterprises' games (such as Rolemaster and Middle-earth Role Playing ) and settings (such as Shadow World) had many types of healing herbs, including ones to restore lost hits, cure diseases and poisons and heal specific types of damage. Dragon magazine #82 article "Wounds and Weeds" listed in-game healing benefits from 12 different Real Life plants, including comfrey, garlic and woundwort. Dragon magazine #269 article "Herbcraft: Expanding the Herbalism Proficiency" had new uses for the Herbalism NWP as well as 21 fictional herbs and descriptions of their properties. 2nd Edition introduced the Herbalism non-weapon proficiency, which allowed characters to heal using herbs. In Warhammer 40,000 spinoff game Necromunda, Stinger mould is extracted for use by the Imperium in making medicine. If used in unprocessed form, it will still give your ganger back some health. In John Milton's Comus, the attendent spirit tells of a shepherd lad who knows these. In William Shakespeare's All's Well That Ends Well, Helena's knowledge of a herb is enough to cure the king. In the first Jade Cocoon game, Calabas Herb is a MacGuffin needed to cure some villagers of a sleeping curse; the sequel downgrades it to a more common healing item. Pokémon has several varieties of healing herb, including a revival herb. But they come with a price - they're very bitter and lower the Pokemon's friendship. Not a problem in some cases, but if you're trying to get something like Golbat, Pichu or Togepi to evolve, or if you want to max someone's friendship for use of the move Returnnote a Normal-type attack which bases its power on friendship, and can be devastating if it's high enough or for a move tutor visitnote some tutors like Drayden will only teach when friendship's maxed you have to watch it. A staple of the Resident Evil series, and they can be mixed together for stronger effects. Green recovers health, blue cures poison, and red cannot be used by itself, but it can be mixed with a green herb to make it stronger. Resident Evil 4 also uses yellow herbs, which extends your life meter. It's never explicitly stated how the herbs are used, though Resident Evil 5 makes the herbs be applied to the body like a spray can and Resident Evil 6 compresses herbs into easy-to-swallow tablets. Both Simba and Tarzan use a renamed Cure spell called Healing Herb in the Kingdom Hearts series. The entire Star Ocean series uses berries and herbs as healing devices. All it takes to restore 20% of your life in the heat of battle with the ultimate evil bent on destroying all existence are a couple of blueberries. Every game in the Grandia series contains several examples. The first game alone contains herbs, health weed, rainbow weed, ginseng, and the white and red sulfa weeds, the latter of which is a MacGuffin which is needed to treat a sick NPC. Each of the Breath of Fire games except for Dragon Quarter contains a healing item called Herb or Healing Herb. In Alundra, herbs are the weakest available recovery item, but also the one of which it's possible to hold the largest amount at a time. Both Lunar: The Silver Star and Lunar: Eternal Blue contain herbs and healing nuts as HP recovery items. Azure Dreams contains a plethora of herbs and fruits which convey various effects on one's stats. The most basic are the medicinal herb, which recovers HP, and the pita fruit, which recovers a monster's MP. There's also one named the Healing Herb which can only be found on a particular floor and functions as a MacGuffin to heal the game's Ill Girl. In Vagrant Story, the low tier recovery items are healing roots and healing bulbs for HP, and mana roots and mana bulbs for MP. The Wild ARMs series traditionally uses berries for HP recovery items (heal berry, potion berry, and mega berry, from weakest to strongest,) and magic carrots for MP recovery. The KO-recovery item is the revive fruit, and all the stat increasing items are apples. In the Suikoden games, the basic recovery item is "medicine," but in the third game, it's possible to collect "medicine" of all the various grades simply by picking leaves off certain plants. Considering that all the Suikoden games are set in a single highly consistent setting and timeline, it's probable that the "medicine" is simply medicinal herbs in every case. In Illusion of Gaia, Herbs, which restore 8 HP, are the game's only healing item. You'll be seeing a lot of these, but considering that the total number in the game is strictly limited, never quite enough. Dragon Quest I contains the "medicinal herb", which is likely the reason that having such items in Eastern role playing games is more the rule than the exception. It continues to appear in each installment of the Dragon Quest series. Healing herbs are a staple part of the players' diet in Demon's Souls. Ponisera in Valkyria Chronicles, though it was only used for a story-related handicap. Herbs are the only portable healing item in Half-Minute Hero. Indiana Jones and His Desktop Adventures has the Yerba Buena as a potent healing item, which the village healer can give you in unlimited amounts for free. Present in Monster Hunter. While it's one of the weakest healing items, carrying some around later on may be useful to craft stronger Potions in case you run out during a hunt. Leaves are the first tier of restorative items in the Shadow Hearts trilogy. They come in three flavors, so to speak: Thera Leaves (HP), Mana Leaves (MP) and Pure Leaves (Sanity Points). Elfroot in the Dragon Age series. A fairly weak healing item on its own, but it can be brewed into stronger healing potions and poultices. Spindleweed and embrium in Dragon Age II also fall into this category. In Summit, the main character searches for a cure for his father, known as the Rose of T'maion. Present in The Matrix: Path of Neo during one level to rescue a chinese herbalist. The herbalist gives Neo a unnamed herbable powder to permanently raise his strength and focus. In Kid Kool, the Plot Coupons gained at the ends of levels are the seven herbs needed to cure King Voldam of a fatal disease. In Golden Sun, herbs are the weakest healing item, and nuts are a stronger one. In Radiation Island, there's one type of flower and one type of leaf you can harvest. Depending on how you craft things with them, you can cure infection, radiation sickness, and zombie bites. The Long Dark has rosehip, reishi mushroom, and old man's beard lichen, which are substitutes to painkillers, antibiotics, and antiseptics, respectively. From the former two, you have to brew tea, which makes them heavier to carry than the tablet form of their conventional counterparts. Conversely, old man's beard lichen, however, needs to be woven into bandage and has negligible mass, compared to antiseptics which came in liquid form. Angels in Nexus Clash have a home plane full of healing herbs that function the same as modern medical equipment and can heal anything from scratches to multiple gunshot wounds to the face. Demons have an Evil Counterpart, the Bone Leech, that runs on Harmful Healing but will still raise one's hit points. The Legend of Heroes: Trails in the Sky plays this trope more realistically, as there are potent medicinal herbs you're occasionally tasked to collect, but only so they can be studied and processed for the production of more reliable medicines. They can also be cooked into Health Food, but the herbs are never useful on their own. Rimworld has the prosaically-named Healroot, which can be used to do everything from salve bruises to stop a gunshot wound from bleeding to act as a surgical anaesthetic and an antibiotic. It's implied to have been genetically engineered specifically to act as a pharmacological Multi Purpose Monocultured Crop some time in the distant past. Nocturne: Rebirth has herb items that apply a Gradual Regeneration effect on a target and heal more than potions in total, despite having a slower effect. Story-wise, Khaos grows herbs that can be used to dispel curses. In Myth The Fallen Lords, the Journeyman (and also the Heron Guard in the sequel) can heal up to 85% of a unit's life with the mandrake root. But never use it on anyone who's above 85% health as it will drop them to that percentage instead. Mandrake root also kills undead units as well. In the My Little Pony: Friendship Is Magic episode "Three's a Crowd", Discord reveals that his "blue flu" can be cured by an infusion made from the petals of a rare flower growing at the other side of Equestria. When Twilight and Cadance finds the flower, though, they discover it's the size of a tree and it's protected by a giant Tatzlwurm. Not that Discord truly needs it anyway.